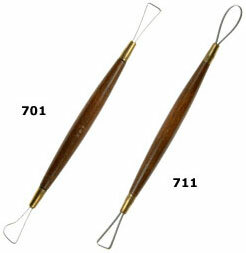 * The 701 and 711 double wire end tools are used by ceramists and potters to trim and foot pottery. * Both have lacquered handles, brass ferrules, and watch spring steel cutting edges. * Made with waterproof glue. * Length - 7 1/2".